The Irish Whale and Dolphin Group (IWDG) was founded in 1990 to campaign for the declaration of Irish territorial waters as a whale and dolphin sanctuary. Just six months later, in June 1991, the Irish Government declared all Irish waters to be a whale and dolphin sanctuary… the first of its kind in Europe. Today, the IWDG comprises a broad mix of conservationists, whale watchers, researchers, educators and, above all, people who are passionate about marine wildlife and cetaceans (whales, dolphins and porpoises). IWDG is “dedicated to the conservation and better understanding of cetaceans in Irish waters through study, education and interpretation”. 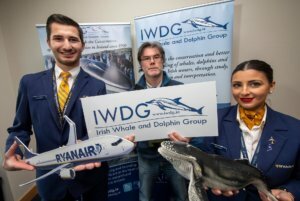 The Irish Whale and Dolphin Group is one of Ryanair’s 2019 environment partners and a portion of all Ryanair customer’s environmental donations will go towards a major study of humpback and fin whales in Irish waters – called Whaletrack Ireland. The project will allow IWDG, with the help of citizen scientists, to carry out photo-identification on individual whales, where they can identify individual whales by their unique markings. The use of drones will help IWDG to measure the size and condition of whales and carry out biopsy sampling to explore genetic origins, diet and pollution burdens. In the long-term, IWDG hope to deploy satellite tags on a small number of humpback whales, to learn more about their migration routes and locate their breeding grounds. WhaleTrack Ireland is a very exciting project, essential to help the recovery and management of this charismatic species, which is an ambassador for marine conservation. This project focuses on benefiting the iconic humpback whale, which was one of the first species to be hunted commercially and whose populations were severely depleted worldwide. After decades of protection their numbers are now increasing in many countries, including Ireland, with many individuals returning annually and some between decades. WhaleTrack Ireland aims to determine what they do in Irish waters, where are they coming from and going to. This will be achieved by identifying humpback whale migration patterns and important feeding areas in Irish waters. “Whales and dolphins are top predators and their health reflects the health of our oceans. We are incredibly fortunate to have a diversity of whale and dolphin species in Irish waters, including large whales such as fin and humpbacks. The IWDG is committed to protecting these species and their habitats and in order to achieve this we need to gain a better understanding of how they use Irish waters.